​Every movement in Kung Fu training is designed to increase the body's potential. It is necessary for the muscles and tendons to be flexible in order to achieve this goal. Our program of stretching, strength-building, and reaction training produces quick results in a developing child. This training not only develops a child's coordination in Kung Fu, but improves their performance in any sport or physical pursuit. 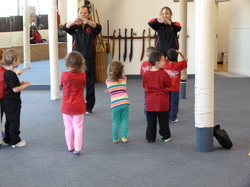 Although self-defense is the foundation of Kung Fu, we are very careful to teach children that Kung Fu is not to be used outside the class in any manner, other than in true self-defense.